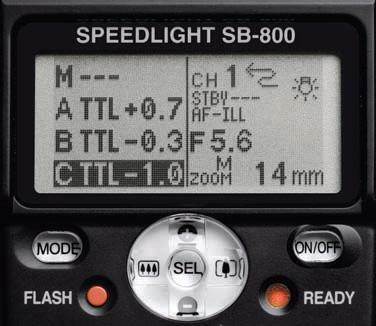 You can configure a Nikon SB-900 speedlight unit in a Master or a Commander mode by using the Power ON-OFF switch, also known as wireless setting switch. 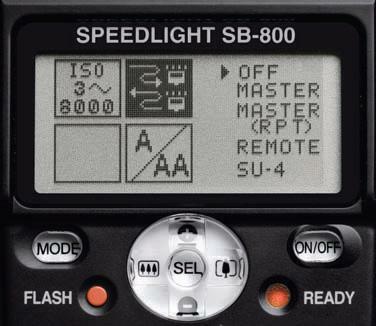 Here are the few steps you can follow to configure a SB-900 flash to work as a master unit. 1. Turn the switch while holding down the button in the center. 2. Align the index on the Power ON-OFF switch to MASTER. This is all you need to do to make a SB-900 work as a master unit. Now, let’s talk about setting the flash mode, flash output level compensation values and the channel number on the master flash unit. 1. Press the Function button 1 on the Master flash unit to highlight “M”. Note: Left most button on the second picture (left to the lock sign) is Function Button 1 and right button to the lock sign is Function Button 2. 2. Press the MODE button, then turn the selector dial to choose the desired flash mode, and then press the OK button. 3. Press the Function button 2, then turn the selector dial to choose the desired flash output level compensation value, and then press the OK button. 4. Press the Function button 1 to highlight the Group ”A”. Group A is selected by default but if you want to select a different group than A, turn the selector dial to choose a different group name. 5. Repeat the procedures in step 2 and 3 to set the flash mode and the flash output level compensation values for the remote flash units in Group ”A”. 6. You can repeat the entire process to set the flash mode and the flash output level compensation values for the remote flash units in Group ”B” and ”C” as well. Note: After setting the output compensation value, press OK twice to reveal the ”Ch” above Function button 2. 7. Press the Function button 2, then turn the selector dial to set the channel number, and press the OK button. 8. Attach the Master Speedlight to your camera and you are ready to control other flash units using SB-900. If you are looking for how to configure a Nikon SB-800 and a Nikon SB-600 flash units in a wireless mode, here are the links for How to configure SB-800 flash unit as a Master flash unit and How to set SB600 flash to work in a Commander Mode.